When I first began coding websites in 1995, InterNic was the only domain name registrar on the planet. They were competent. You could reach someone who knew their job and they were easy to understand. If you needed something you could pick up the phone and resolve your issue in short order. For a long time it was still pretty good. You could easily resolve what you needed by phone and there were few problems. 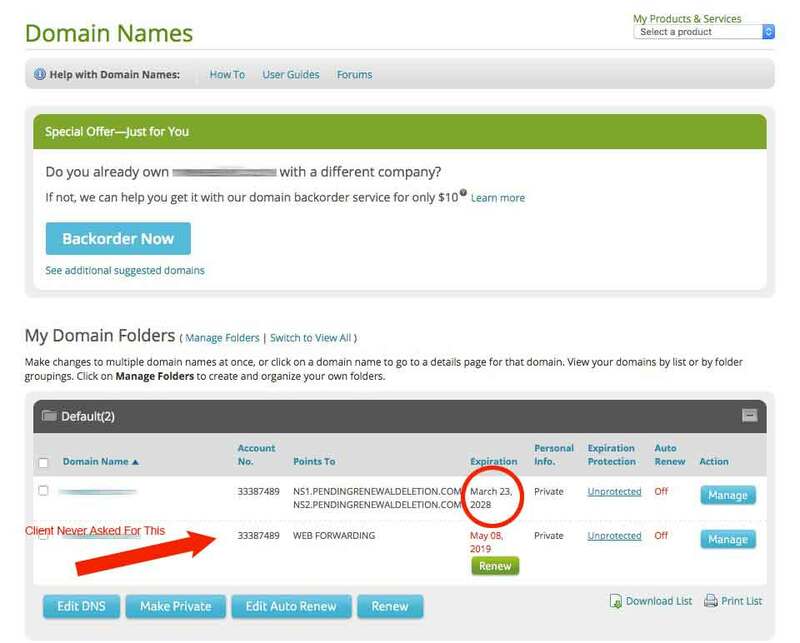 Back in 2010 I had TWO bulk hosting accounts at $700 a year each to handle all my own sites plus 30 of my client’s domains. This is a LOT of money. And about this time the customer service had started to degrade. If you had to contact NetSol, you were getting someone in Bangaladesh – or someplace where they all sound like robots – you know the type. You’ve spoken with them. The people who have been taught English but with zero inflection. “We’re From France” – Conehead style speech. Note: Dell had a similar problem in the early 2000s. They had farmed all their support offshore and business clients were having none of it. Too hard to understand some of the so-called “support” operators and a general lack of knowledge. So Dell set up a shiny new call center in Addison Texas right off the Tollway just for their business clients and everything was right with the world. If you were a business customer of Dell. If you were a run-of-the-mill individual, you were stuck with inferior support. This is the point in time where the customer service and tech support started a rapid slide into the abyss. And this is the time where I jettisoned NetSol for vastly more affordable hosting plans. Some had better support. Some worse. It’s like playing Whack-A-Mole when switching hosting companies. Sometimes they start out great like InterNic, then get gobbled up by some conglomerate and go straight to Hell. That’s what happened to NetSol. Eventually they were absorbed by the Web.com behemoth and the previously deteriorating support went straight out the window, hurtled down 110 stories, through an open manhole cover and right into the sewer. I’ve been moving clients away from them at every opportunity since. Today’s horror story starts early Monday morning when I get a text from a client. He had contacted me a month or so ago regarding a renewal notice from NetSol and I advised him to pay it, as that’s where his email comes from. I host only email and no website these days for his company. NetSol is the registrar and I do the hosting. Everything went smoothly until 3 days ago. Monday Morning I get a text that says he is taking a plane to Italy in the afternoon and has no email. I log into my hosting console and try to access his email. It shows an error that the email is “remote”. 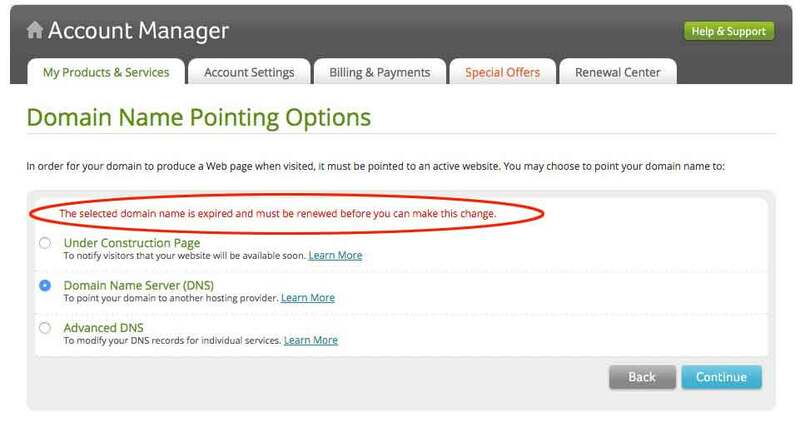 This means the DNS (Domain Name Service – digital White Pages) is no longer pointing to my server. So I log into his NetSol account which shows the domain active until 2028. You will notice the second line showing expired – that is a .online domain name no one ever asked for, wanted or approved. When I try to edit it back to where it belongs then I get: The selected domain name is expired and must be renewed before you can make this change. Monday morning my client and I were on a conference call with NetSol support and we were assured the fix would be expedited, as indeed they had a record of his renewal payment. I got another text yesterday from Italy that he STILL had no email. I wasted at least 30 minutes on the phone with NetSol and another 30 minutes in an online support chat session where I was assured this issue would be escalated but that these changes take 24-48 hours to initiate. I can see that if the problem is a NOC issue (Network Operations Center) or some “Act of God” that is out of their control. But when it is a Cluster F*ck initiated by NetSol it would be reasonable to expect they would give it a Level One priority. After all, it is NetSol that has screwed the pooch here, not my client. He in good faith paid his domain renewal bill. Someone at NetSol fat-fingered the account and sent it into Purgatory where it continues to reside. Meanwhile we are going on THREE DAYS of no email and my client is in Italy for 10 days. Today I sent two Twitter messages to NetSol and I’m acutaly getting a response. But the account is still locked. Apologies don’t mean a thing when someone has lost contact with the entire world because of your mistake. Drop EVERYTHING and make it RIGHT.